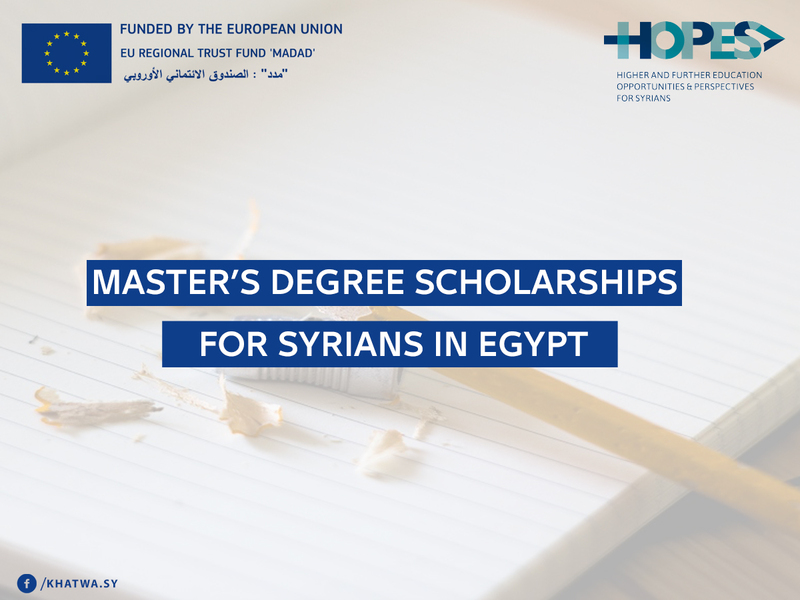 The project HOPES (Higher and Further Education Opportunities and Perspectives for Syrians), funded by the EU’s Regional Trust Fund in response to the Syrian Crisis, the ‘Madad Fund’ and implemented by the German Academic Exchange Service (DAAD), the British Council, Campus France and Nuffic, is pleased to announce the second intake of its scholarship program for refugees from Syria in Egypt. The project provides refugees of post-secondary age from Syria and young people in host communities in Egypt, Iraq, Jordan, Lebanon, and Turkey with the opportunity to access higher education in the host countries and to contribute to the preparation of the post-crisis reconstruction of Syria. The HOPES scholarship covers two years of post-graduate education (Master’s Degree). Extension to the second year is subject to the demonstration of satisfactory performance during the first year of the study program. be admitted or already enrolled at an Egyptian governmental university, for full time masters’ degree studies in 2017. *Women are encouraged to apply. A valid copy of UNHCR Asylum seeker certificate or proof of registration by the UNHCR. Copies of High School Diploma, Bachelor degree certificates and transcripts. Originals must be shown to the HOPES selection committee during the interview should the applicant be shortlisted. An original statement from the university which states the tuition fees for the academic year 2017-2018. Applications are received up to 13 July 2017 and assessed for compliance with the eligibility criteria. Short listed candidates are invited for an interview with the HOPES selection committee. Please note that the travel expenses for participation in the interviews cannot be covered. Selected candidates are informed of the committee’s decision by telephone and in writing no later than 15 August 2017. Living allowance for basic expenses, such as food, local travel and rent during the semester. British Council-City Stars branch in Cairo: City Stars, Phase 1, Floor 6 Heliopolis Cairo. To the attention of: Nancy Fanous-HOPES Educational Project Manager-The British Council. Please note that you may only submit ONE application – either electronically or in hardcopy.